Increasingly, Trump stands alone. Reporting indicates his sense of betrayal from current and former officials speaking out in Bob Woodward’s book and in the anonymous Times op-ed has left Trump outraged and paranoid — canceling meetings, and trusting a shrinking circle of his family and Stephen Miller. The sense of a pending coup from the “deep state” was further exacerbated by the stunning news that Trump’s former campaign manager, Paul Manafort, is cooperating fully in the Mueller probe. Even by Trump standards, his behavior this week was unbalanced and alarming. On the solemn anniversary of 9/11, Trump acted entirely inappropriately, with no one to rein him in. With Hurricane Florence approaching and questions about his past handling of hurricanes resurfacing, Trump bragged about his regime’s performance in Puerto Rico, and then careened into conspiracy theories about the actual death toll. Stories abound this week about the impact of the regime’s cruel immigration and refugee policies — and the continuing whitening of America. With Hurricane Florence approaching, news broke that Trump’s FEMA director Brock Long is under an ethics investigation and has been asked to resign, along with stories that Defense Secretary Jim Mattis may get pushed out, as well as a continuing outflow of senior officials. As the week came to a close, questions surfaced about Brett Kavanaugh, Trump’s nominee for the Supreme Court, and allegations of sexual assault in high school; but Republicans appear unheeded in bringing the nominee up for a vote, mindful that as Trump’s approval continues to decline, they may well lose control of the Senate in midterms. Twenty months into office, just half of positions considered key roles in Trump’s executive branch have been filled (364 of 705), and more than 1 in 5 positions have yet to have a nominee named (154 of 705). On Monday, a CNN poll found Trump’s approval rating has fallen 6 points in the last month to 36%. His approval among independents has fallen from 47% approval last month to 31% now, a new low. On Monday, a Quinnipiac Poll found voters give Trump his lowest grade for honesty since he was elected, saying 60-32 percent that he is not honest. Trump also got low grades on most character traits. In all, eight high-quality polls completed over the two last weeks show Trump’s approval rating falling, on average, three points. The dip could have an impact on midterms. On Thursday, WAPO reported Trump surpassed 5,000 false or misleading claims on the 601st day of his time in office. In the past nine days, Trump averaged 32 false or misleading claims a day. WAPO reported top civil servants are leaving the Trump regime at a record clip: in fiscal 2017, 18.6% of Senior Executive Service (SES) members left the government. Experts warn of a future crisis from the leadership drain. On Saturday at the second annual “Mother of All Rallies” at the National Mall, billed as an all-day event with the goal to “preserve and protect” American culture, approximately 350 people showed up at the rally’s peak. The Southern Poverty Law Center reported the event headlined conspiracy theorists, hate groups like The Proud Boys and American Guard, and famous alt-right names like Mike “Mersh” Schiele and Joey Gibson. The Guardian reported Trump ordered $25 million earmarked for the care of Palestinians in East Jerusalem hospitals be redirected to “high-priority projects elsewhere,” according to a State Department official. Republicans in the House passed a bill to reclassify dozens of federal crimes such as burglary, fleeing, and coercion through fraud, as “crimes of violence,” making them deportable offenses under immigration law. WAPO reported thousands of Vietnamese in the U.S. face deportation after the Trump regime reinterpreted a 2008 agreement reached by W. Bush and Vietnam, a policy shaped by senior adviser Stephen Miller. The new policy could impact 8,000 Vietnamese who have green cards but never became U.S. citizens. At least 57 people who arrived before 1995 were in ICE detention in mid-June, and 11 have already been deported. Reuters reported that despite a record high of 68.5 million forcibly displaced people worldwide, the Trump regime is on track to take in roughly 22,000 refugees, a quarter of the number admitted in 2016 under Obama. The Trump regime set the 2018 annual refugee ceiling at 45,000, the lowest number since the refugee program was established in 1980. The 22,000 admitted is the fewest in four decades. The regime has extended the strictest type of vetting to women as well as men from 11 countries, mostly in the Middle East and Africa, and reduced the number of officials conducting refugee interviews from 155 to 100. Under the new Trump policies, the percentage of refugees who are Muslim is now a third what it was two years ago, while the percentage who are Europeans has tripled. Current and former officials say the new policy is being driven by a small core including Miller, chief of staff John Kelly, and Gene Hamilton, a former advisor at the Department of Homeland Security. On Wednesday, NYT reported despite reunification of most of the children separated under Trump’s zero-tolerance policy, the number of migrant children in detention has quietly shot up more than fivefold. According to data obtained by the Times, children in federally contracted shelters for migrant children reached a total of 12,800 this month, up from 2,400 such children in custody in May 2017. Federal shelters are at or near full capacity. On Tuesday, the Trump regime said it would triple the size of a temporary “tent city” in Tornillo, Texas, to house up to 3,800 children through the end of the year. The Guardian reported conditions at detention centers at the U.S. border have grown only grimmer since Trump’s “zero tolerance”policy was first put in place. Detention centers are overcrowded and unhygienic. Migrants are prone to outbreaks of vomiting, diarrhea, respiratory infections, and other communicable diseases. Basics like food and water are inadequate. Detroit Free Press reported ICE plans to deport Francis Anwana, a 48 year-old who is deaf and has cognitive disabilities, back to Nigeria. Several years ago, his visa was not renewed as he was being moved in foster care. Immigrant advocates, who say deporting him would be a virtual “death sentence” given his severe disabilities, have raised concerns with ICE and are pushing to prevent his deportation. He has been in the U.S. since age 13. The Southern Poverty Law Center reported acting ICE director Ronald Vitiello attended an annual media event for anti-immigrant hate group Federation for American Immigration Reform (FAIR). On Monday, Ben Zayn, the mayor of Kenner, Louisiana, banned local booster clubs from purchasing Nike apparel for use at public recreation facilities, citing the company’s campaign honoring Colin Kaepernick. The College of the Ozarks, a small, private college in Missouri, said it would stop using uniforms with the Nike logo. Truett McConnell University, a small college in Georgia, announced it would do the same. WAPO reported the director of the Morgan County Public Library in West Virginia said it will not stock a copy of Bob Woodward’s book “Fear,” after residents expressed mostly dismay and outrage on a Facebook post. Later, the president of the trustees of the Morgan County Public Library reversed the decision, saying the board had not known about it. On Friday, the Texas State Board of Education voted to eliminate mention of Hillary Clinton and Helen Keller from the state’s history curriculum as part of an effort to “streamline” the curriculum in public schools. WAPO reported Ron DeSantis, the GOP candidate for Florida governor, spoke four times at a conference hosted by David Horowitz, an activist who has said that African Americans owe their freedom to white people. Valerie Scogin, a high school math teacher in Louisiana wrote in a racist Facebook post, “go-back-to-Africa,” “quit acting like animals,” and cease “voting for handouts and pay taxes.” She was later fired. In an online NRA-TV program mocking additions of adding female and international characters to the children’s television show “Thomas & Friends,” host Dana Loesch featured a video of trains in KKK white hoods. On Wednesday, in an op-ed by Barbara Res, who led construction at the Trump Organization, Res claimed Trump ordered an architect not to include braille in Trump Tower elevator panels. On Wednesday, Eric Trump told “Fox & Friends” that Woodward wrote his book to “make three extra shekels.” Shekels is a term used by white nationalist to describe money tainted by Jewish influence. The gubernatorial campaign of Ron DeSantis, under fire for recent racist remarks about his opponent Andrew Gillum, blocked a former state official from co-chairing a fundraiser, citing racist remarks. Patient advocacy groups filed a lawsuit against the Trump regime’s expansion of bare-bones “short-term” health plans, which undermine the stability of the Affordable Care Act. A woman born in Kansas was told by the U.S. Passport Agency out of Houston, Texas that her birth certificate was not enough to prove citizenship. After her senator intervened, the matter was corrected. WAPO reported on Trump shrinking the Environmental Protection Agency. Since he took office, nearly 1,600 workers have left, while fewer than 400 were hired, bringing staffing levels down to levels not seen since the Reagan administration. Among those who have resigned or retired include some of the EPA’s most experienced veterans, as well as young environmental experts who would have replaced them, causing concern about a brain drain at the agency. On Monday, NYT reported the Trump regime is taking its third major step this year to roll back federal efforts to fight climate change, making it easier for energy companies to release methane into the atmosphere. The EPA will propose weakening an Obama-era requirement that companies monitor and repair methane leaks, and the Interior Department will repeal restrictions on venting and burning methane. This third step, in addition to weakening rules on carbon dioxide from vehicles tailpipes in July and coal-fired power plants in August, represents the foundation of the U.S. effort to rein in global warming. On Monday, the Congressional Budget Office issued its monthly review for August 2018, which showed the federal deficit had grown by $222 billion in the first 11 months of fiscal year 2018, reaching a record $895 billion. The CBO said the increase was due mostly to the new Republican tax law and Congress’ routine decision to increase spending. The CBO also said the deficit will approach $1 trillion by the end of Fiscal Year 2019. On Wednesday, a Washington federal court judge ruled against Betsy DeVos’s Department of Education, saying the department’s postponement of the Obama-era Borrower Defense rule was procedurally improper. The lawsuit brought by 19 states and the District of Columbia accused the department of wrongly delaying implementation of regulations to protect students who took out loans to attend college from predatory practices. Trump’s Interior Department is quietly moving to lease hundreds of thousands of acres of public land to energy companies, for commercial purposes such as mining for minerals and drilling for oil and gas. According to data compiled by environmental groups, the Bureau of Land Management will put 2.9 million acres in New Mexico, Colorado, and Arizona up for potential leasing in the next four months. NBC News reported next Thursday FEMA will do its first test of the alert system, which would allow Trump to send a message to most U.S. cell phones. More than 100 mobile carriers are participating in the roll out. On Monday, White House economist Kevin Hassett said at a press briefing that Trump’s tweet that the Gross Domestic Product was the highest “in over 100 years” was not true, saying highest in 10 years was accurate. Hassett, who was part of the first White House press briefing in 19 days, denied he was included because of Obama’s claim last Friday that Trump inherited an economic recovery spurred by his presidency. In another tweet Monday morning, Trump mischaracterized a comment Obama made more than two years ago. Trump tweeted that Obama said Trump would need a “magic wand to get to 4% GDP.” This is a false claim. WAPO analyzed the content of Trump’s July rallies and found 76% of his 98 statements were false, misleading, or unsupported by the evidence. Last week, the average percentage for the two rallies was 72%. NBC News reported a record-breaking 100 women could be elected in 2018, as 30 to 40 new women are poised to win. The increase is driven by Democrats, as a record breaking 50% of new candidates are women. The previous record was 24 set in 1992’s “Year of the Woman,” in a backlash against Clarence Thomas’s Supreme Court confirmation. This year is in response to Trump and his policies. On Wednesday, Juli Briskman, the cyclist who got fired for flipping off Trump in Week 52, announced she is running to represent the Algonkian District on the Loudoun County Board of Supervisors in Virginia. On Thursday, in New York’s primary, Letitia James became the first black woman to win a major party statewide nomination in New York, defeating her Democratic opponents for attorney general. On Sunday, Vice President Pence said on “Face the Nation” that Mueller’s team has not asked him for an interview, but he has provided requested information. Pence said he would be willing to speak to Mueller’s team. On Sunday, Steve Bannon told Reuters that Trump is facing a “coup” based on the anonymous NYT op-ed, adding the “Republican establishment” was looking to nullify the 2016 election and neuter Trump. Cohn reportedly explained to Trump that printing money could lead to inflation and be catastrophic for the economy. Cohn was “astounded at Trump’s lack of basic understanding” about the federal debt. Vanity Fair reported Trump is bitter over Woodward’s book and former allies and employees who betrayed him. He let Cohn and Rob Porter know he would attack them publicly if they didn’t disavow the book. They both did. Trump is reportedly even more fixated on finding the author of the NYT op-ed. Meetings have been derailed because of Trump’s suspicions. Donald Jr. has told people he’s worried Trump is not sleeping because of it. The only person Trump trusts outside of family is Stephen Miller. The op-ed has validated Trump’s belief, propagated by Miller and Bannon, that the deep state is out to get him. Trump believes there is a coup. On Monday, CNN reported the White House has again changed phone policy in reaction to Omarosa’s leaking of tapes. White House staffers will no longer be able to leave phones in lockers outside the Situation Room. The State Department also said the closure was “consistent with” concerns about Palestinian calls for an investigation of Israel by the International Criminal Court. Neither Israel or the U.S. recognize the ICC. On Monday, national security adviser John Bolton said if the ICC pursues charges against Americans over alleged war crimes committed in Afghanistan, those involved will be banned from traveling to the U.S.
On Sunday, Reuters reported Energy Secretary Rick Perry will meet with Russia’s Energy Minister in Moscow on Thursday. Perry will be the most senior U.S. official to visit Russia since the Helsinki summit. On Tuesday, Russia held Vostok 2018, its largest military drills since 1981 when Ronald Reagan was inaugurated as president, at a time of heightened tensions between the West and Russia. Sen. Mark Warner, ranking Democrat of the Senate Intelligence Committee, said the committee will not release its report before midterms, citing wanting to conduct more interviews, including Michael Cohen and George Papadopoulos. On Sunday, Axios reported that Trump is expected to declassify documents related to the government’s surveillance of Carter Page, and the investigative activities of Bruce Ohr. Trump allies on the House Intelligence and Judiciary committees believe the release will taint the Trump-Russia investigation by showing it was illegitimate, and that the Obama administration illegally spied on Page. On Tuesday, NBC News reported that U.S. intelligence agencies believe Russia is the main suspect in the mysterious attacks that led to brain injuries of U.S. diplomats in Cuba and China. On Tuesday, CNN reported New York tax investigators met with Michael Cohen’s attorney, Guy Petrillo, and possibly Cohen, as part of a state probe regarding Cohen and the Trump Organization. BuzzFeed reported on suspicious money transfers. The first came 11 days after the June 9 Trump Tower meeting: an offshore company controlled by Aras Agalarov wired $19.5 million to his account in New York. The second came shortly after the election when the Agalarov family sent a series of transactions totaling $1.2 million from their bank in Russia to an account in New Jersey controlled by Arar’s son, Emin Agalarov. Dutch newspapers reported that the two Russian spies who had been plotting a cyber attack from the Netherlands on a Swiss defense lab which was analyzing the nerve agent used in Britain were detained and expelled. Swiss authorities said the investigation began in March into “suspicion of political espionage,” and led to a joint investigation by Swiss, Dutch, and British intelligence services. The attempted attack is the latest example of the Kremlin waging a sophisticated and unconventional campaign to work its will abroad, and to undermine adversaries and their alliances. Rep. Trey Gowdy told The Hill that the House Intelligence Committee should release all transcripts from the Russia probe. Gowdy’s remarks echo those of House Intelligence Democrats, who have called for the same. On Tuesday, the solemn anniversary of 9/11, Trump started the day with a series of tweets rehashing reports on Fox Business Network and Fox News while he traveled to the Flight 93 memorial in Shanksville, Pennsylvania. The topics of Trump’s morning tweets included: “New Strzok-Page texts,” and “collusion between the FBI & DOJ, the Hillary campaign,” and Obama attorney general Eric Holder. Trump then retweeted a 9/11-related post by social media director Dan Scavino and on Hurricane Florence, before resuming a series of tweets attacking his adversaries. 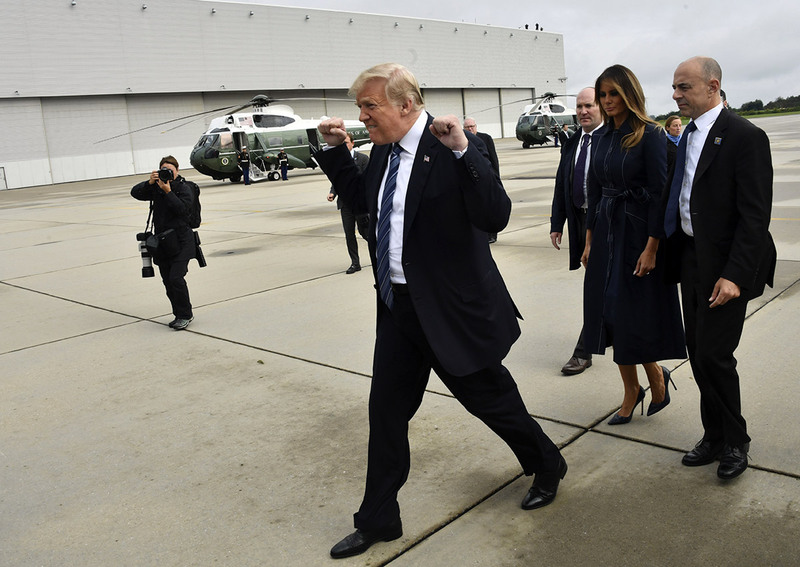 Photos of Trump fist-pumping as he exited the airplane in Johnstown, Pennsylvania and walked toward supporters drew national attention and condemnation of being inappropriate for the solemn day by many. At the Shanksville memorial site where Trump was giving a speech, he walked up to the podium, while pointing at people in the crowd and mouthing the words “thank you” as they clapped for him. Later Tuesday, in remarks in the Oval Office, Trump said his regime’s response to Hurricane Maria was “an incredible, unsung success” and falsely claimed Puerto Rico had virtually no electricity before the storm. On Tuesday, BuzzFeed reported that FEMA received 2,431 requests for funeral assistance from Puerto Ricans related to the hurricane Maria, and approved just 75, or 3%. On Wednesday, Sen. Jeff Merkley revealed on the Rachel Maddow Show that the Trump regime redirected $9.75 million from FEMA to ICE for detention and removal, months before hurricane season is set to begin. The transfer of funds was approved by the Republican chairs of the House and Senate Homeland Security appropriations subcommittees, but not by the rest of the subcommittees’ members. Director Long claimed that none of the money came from the Disaster Relief Fund. However, the money came from the response and recovery, preparedness and protection and mission support operations budgets. On Thursday, NBC News reported that the Department of Homeland Security transferred $169 million from other agencies to Immigration and Customs Enforcement for the detention and removal of migrants this year. According to a document sent to Congress by DHS, many of the transfers came from key national security programs, including Domestic Nuclear Detection Office, the U.S. Coast Guard, FEMA and several TSA programs. DHS also transferred $33 million from other ICE programs to pay for detention and removal, bringing the total to $202 million transferred in. On Wednesday, NYT reported Trump started a new strategy in mid August of using short videos of himself, shared on Twitter, a strategy reportedly designed by former Fox News executive Bill Shine. The videos, shot with the White House as the setting, have thus far been less viral and gotten less engagement, in the form of responses, likes and retweets, than Trump’s most provocative text tweets. On Thursday, Politico reported FEMA director Brock Long is under investigation by the Department of Homeland Security inspector general into whether he misused government vehicles during his commutes. The inspector general’s interest was drawn after one of the vehicles used by Long for trips back home to Hickory, North Carolina, on the weekends — a black Suburban — was involved in an accident. Long has also reportedly been clashing in recent weeks with his boss, Homeland Security Secretary Kirstjen Nielsen over his travel logs, as the hurricane season approaches. She confronted him at a meeting in late August. On Wednesday, the Irish Independent reported Trump canceled a November visit to Ireland to visit his golf course in Doonbeg, Co Clare as part of a trip to Europe for Armistice Day celebrations. On Wednesday, at a news conference, The White House said it has not yet made a final decision on whether Trump will make a stop in Ireland. The Irish Ambassador to the U.S. said he had not been informed of the trip. On Wednesday, Independent UK reported that Trump canceled the trip to Ireland because massive protests have already been planned to greet him. On Friday, the NYT wrote an Editors’ Note to an article which inaccurately reported U.S. ambassador to the UN Nikki Haley spent $52,701 on curtains for the UN residence. The order was placed under the Obama administration. On Thursday, the bitter fight over Brett Kavanaugh’s confirmation plunged into chaos as Sen. Dianne Feinstein disclosed that she referred a letter that describes alleged sexual misconduct involving Kavanaugh in high school to the FBI. On Friday, reporters Ronan Farrow and Jane Mayer of the New Yorker obtained the letter, which Sen. Feinstein has had since July. Kavanaugh “categorically and unequivocally” denied the allegations. On Wednesday, ABC News reported Paul Manafort has been in ongoing negotiations with Mueller’s office over a potential plea agreement. The negotiations have picked up steam in recent weeks. On Friday, CNN reported the federal prosecutors in the Southern District of New York are considering criminal charges against former Obama White House counsel Greg Craig for failing to register as a foreign agent. Prosecutors are also considering taking action against the law firm Skadden, Arps, Slate, Meagher & Flom where Craig was a partner during the activity under examination. Like Alex van der Zwaan, who also worked at Skadden, Craig was involved in promoting a report on Yulia Tymoshenko to members of Congress and the media on behalf of the then-president of Ukraine, Viktor Yanukovych. The inquiry is a Mueller referral, and is now in advanced stages and is closely linked to a case against Manafort. Details about Skadden’s work was disclosed on Friday by Mueller’s office in charges against Manafort. On Thursday, Rudy Giuliani confirmed Manafort and Trump have a joint defense agreement that allows sharing of confidential information, and that Trump’s lawyers and Manafort’s have been in regular contact. Court documents revealed that Manafort was talking in detail with Mueller’s team as early as Monday. Manafort made multiple statements and a written proffer as the two sides worked toward a deal. Manafort said his Ukraine work included shaping U.S. perception of Yanukovych and his pro-Russia party. He admitted he didn’t register as a foreign agent and misled federal investigators about his work. Manafort also pleaded guilty to cheating the IRS out of $15 million and lying repeatedly to try to cover his tracks. Manafort faces as much as 10 additional years and fines of $250,000 per count based on his plea. As part of the plea, Manafort will forfeit a host of assets, including his condo at Trump Tower, worth an estimated $21.7 million. He will also return to prison while he cooperates. Manafort agreed to cooperate “fully and truthfully,” and if he complies, he stands to have years shaved off his prison sentence, perhaps serving no time, and to have his family hold on to some property. Manafort has agreed to meet with law enforcement regarding the investigation without the presence of his counsel. Both cases brought against Manafort by the special counsel stemmed from his work in Ukraine. Manafort may provide key information on the June 9 Trump Tower meeting, changes in the RNC platform, and other areas. Dershowitz also said a presidential pardon now is “off the table, saying if Manafort is given a pardon, then he can’t take the Fifth Amendment” and “would have to testify” and could be called in front of a grand jury. Manafort’s guilty plea revealed hardball tactics. He enlisted a foreign politician secretly on his payroll to deliver a message to Obama in the Oval Office. He also smeared adversaries to protect pro-Russian Yanukovych. Manafort spread stories that jailed Ukrainian politician Yulia Tymo­shenko was a murderer. In 2011, Manafort spread stories that then Secretary of State Hillary Clinton was supporting anti-Semitism by taking up Tymo­shenko’s cause. In 2012, Manafort paid Skadden Arps $4.6 million to write a report analyzing Tymoshenko’s trial that he then used to spread to the false claim that her conviction had not been politically motivated. On Friday, Vanity Fair reported it has become common knowledge among close friends of Michael Cohen that he is talking to Mueller’s team. The extent and purposes of the talks is not clear. On Friday, WSJ reported, as Hurricane Florence was forming in the Atlantic, senior Trump officials were considering replacing FEMA director Long, amid allegations he misused resources. DHS inspectors found that Long, who was under surveillance, often left FEMA headquarters on Thursdays and traveled home with a caravan of federal workers, who stayed in nearby hotels for the long weekend. The inspector general is also reviewing communications between Long and a FEMA contractor that appear to include discussions about future employment. Secretary Nielsen brought Long details of the inspector’s preliminary findings, and asked him to resign if the allegations are true. Trump has been frequently meeting with Long this week ahead of Hurricane Florence. Intercept published a story about Kavanaugh which was originally posted at Think Progress, but was suppressed at Facebook after conservative Weekly Standard fact-checked it to be false. It was not. Trump also blamed the response in Puerto Rico on it being “an inaccessible island with very poor electricity and a totally incompetent Mayor of San Juan,” referring to his adversary San Juan Mayor Carmen Yulín Cruz. Trump closed out Friday, tweeting that the “Fake News Media” did not cover when Obama said there were 57 states in 2008. This is false. On Saturday, NYT reported Trump’s relationship with Defense Secretary Jim Mattis has frayed. Trump is weary of comparisons to Mattis as the adult in the room, and increasingly concerned that Mattis is a Democrat at heart. Officials say Trump has largely tuned out his national security aides as he feels more confident in himself. Mattis has balked at some of Trump’s requests and is protective of the military being used for political purposes. Officials say Trump may fire Mattis, a significant departure given that foreign allies and adversaries, as well as the U.S. national security establishment, view Mattis as the one thing standing between Trump and global tumult. Mattis has largely avoided the media. Aides say he is fearful about being put on the spot by questions that will expose differences with Trump. He has refused requests to go on “Fox & Friends” to praise Trump’s agenda. On Saturday, the White House issued a “lid” for the day, meaning no planned news events or presidential movements. Trump did not tweet through noon, or golf, as would be typical. Trump fist-pumps as he arrives at John Murtha Johnstown-Cambria County Airport in Johnstown, Pennsylvania with First Lady Melania Trump, on September 11, 2018 en route to Shanksville, Pennsylvania.